on the weekend of the 12-15th July 2019. No doubt we will have a great visit and meet up with our friends from Ancenis. We joined our German friends from Bad Bruckenau to have an amazing weekend! came and visited Kirkham. We had a superb time! over the weekend and met up with many friends from Ancenis. see the story of the weekend and photos! Another wonderful visit to Bad Brückenau. What a superb visit to Ancenis! The Kirkham Twinning Association was started in 1974. The original link was between the Rotary Clubs of Ancenis and Kirkham set up by a local gentleman, Gordon Himsworth. 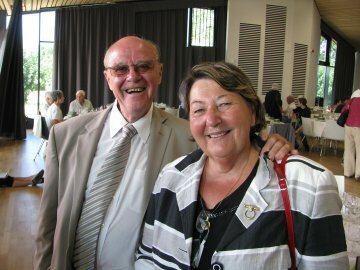 Gordon met his wife Jackie whilst at University in Manchester, married her and moved to Ancenis. The man himself with his wife Jackie! After the Rotary link was broken the two towns made a more formal link in 1973 again through the efforts of Gordon. Ancenis was twinned (1990) with Bad Brückenau in northern Germany. So there you have it! Not only a twinning but a tripling! We usually have at least one visit a year usually over a long weekend, arranged in rotation, unless there is something special on in one of the towns. Whilst we don't tend to all travel together we do all meet up in the town and our hosts put on some sort of entertainment, we've had barbeques, concerts, firework displays, visits out to local attractions and celebrations of local events. We, of course, reciprocate with our French and German visitors being welcomed to Kirkham. In fact everything to make for a very enjoyable time! All our activities are, of course, self-funded and we do not get any financial support from the local council.